All of the 'winter wonders' featured in this blog are comfortably indoors, except for one world-class attraction -- Forsyth Park [Flickr photo below courtesy ercwttmn]. The genteel experience and beauty of Savannah's iconic central park will explain why this popular Savannah place is on every romantic and picturesque bucket list worth making! Forsyth Park. 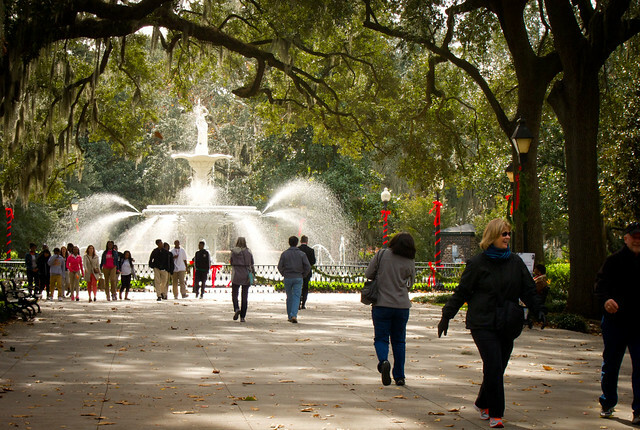 Forsyth Park (above) is a great place to walk, even if you're bundled up in Savannah's slight cold in December and January. The Forsyth Cafe is a great spot for a comfort break and a nestling cafe setting to enjoy a warm winter drink. Beverages and made-to-order sandwiches are sold there. Betty Bombers is right near too, just a few steps off the park's north boundary in the American Legion building (Park and Bull Street). Always a possibility, there will be Martinis at the Mansion's 700 Drayton restaurant / pub on a cold winter night, too. Saint John the Baptist Catholic Cathedral. Located on Lafayette Square, Walk-in tours are available at no charge. Across from the Cathedral is a popular cafe for a quick snack, Mirabelle; try the cafe's Peach Cobbler Liege Waffle -- the newest talk of the town among foodies! Check the Cathedral's official mass schedule to confirm Christmas and New Year's Mass times. In 2014 the mass times were as follows: Christmas Eve Mass, December 24 at 12:00 Midnight, Doors Open at 11:00 PM, Music Vigil Concert Begins at 11:00 PM; Christmas Day Masses 8:00 AM and 10:00 AM, 11:30 AM Latin Mass; New Year’s Eve Mass, December 31 at 6:00 PM; New Year’s Day Mass, January 1 at 10:00 AM. 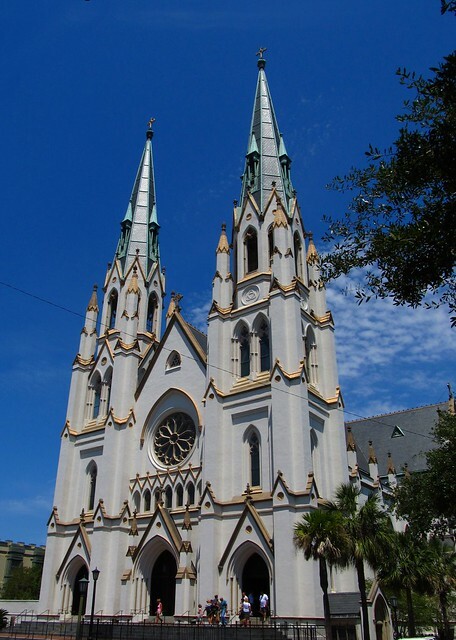 On February 5, 2016, The Savannah Philharmonic presents Mozart Mass in C in this majestic Cathedral. First African Baptist Church. Located on Franklin Square in downtown Savannah this historic church was originally built by slaves seeking a religious place of workshop away from the plantations. The congregation offers tours to glimpse holding places in the church, once used for the 'underground railroad' of the 1800s. The landmarks of those journeys are needed again. fallen in the direction of his true north. Telfair Museums' Owens-Thomas House. This mansion's stories are laced with many American firsts! World renown as the preeminent example of English Regency architecture in North America, architects, historians, gardeners, and those who admire the best of the classic southern lifestyle will love the mansion's fascinating stories. American Revolutionary hero, General Marquis de Lafayette spoke to the citizens of Savannah (1825) from southern balcony of the Owens-Thomas House. The manicured gardens of this National Historic Landmark impress visitors also year around. Juliette Gordon Low Birthplace (founder of Girl Scouts). A Girl Scout national center in Savannah, the Girl Scout founder's birthplace home welcomes young girls' troops, alumni and visitors to the prominent Gordon mansion. Hear the stories of visits and dinners hosted for U.S. Presidents and visiting dignitaries, as well as family members who reportedly haunt the home. Isaiah Davenport House. The 1820's Federal Style mansion is as much a symbol of Savannah's famous historic preservation as it is a treasured home. "Threatened with demolition in 1955, a group of community-spirited citizens joined forces to purchase the Davenport House. This was the first act of the Historic Savannah Foundation, which has gone on to save hundreds buildings in the historic city." Source: Davenport House Museum. A don't miss Christmas event at Davenport House Museum is the Holiday Evening Candlelight Tours -- December 26 - 30, 2015 from 6 to 8:30 p.m.
Telfair Museum's Jepson Center. Take in a delightful organic / artisan lunch in the Jepson Cafe. Enjoy upcoming winter exhibitions at this popular modern museum include Mickalene Thomas at Giverny, I Have Marks to Make (art by disabled and rehabilitating artists), Monet and American Impressionism. Ships of the Sea Museum. Called "The Castle" by the mansion's original owner, the meticulous restored home is central to National Maritime Day (May 22), celebrating the date America's first steamship departed to cross the Atlantic Ocean. "The Congress, by a joint resolution approved May 20, 1933, has designated May 22 of each year as "National Maritime Day," and has authorized and requested the President to issue annually a proclamation calling for its appropriate observance." The Ships of the Sea Maritime Museum was founded in 1966. Exhibits include ship models, paintings and maritime antiques, principally from the great era of Atlantic trade and travel between England and America during the 18th and 19th centuries. The mansion was built for Savannah Steamship Company's principal, William Scarborough, who hosted U.S. President James Monroe (May 1819) as his house guest. Georgia State Railroad Museum. On September 27, 1825, the first iron railroad in England, the Stockton & Darlington, was thrown open to the public. In Savannah, William Washington Gordon (January 17, 1796 - March 20, 1842), is the honored railway pioneer. He founded and served as the first president of the Central Railroad and Banking Company of Georgia, which would later be reorganized as the Central of Georgia Railway. Today the Central of Georgia lines are a component of the Norfolk Southern Railway. A monument to honor Juliette Gordon Low's grandfather, Mr. Gordon, is in the center of Wright Square. Famously, one Civil War story connects the railroads to the Christmas season in Savannah. On his army's famous March to the Sea, Union General William "Sherman's neckties" were tactics to destroy rail lines in the Confederate southern states. On December 22, 1864, Genera Sherman presented the city of Savannah, Georgia, to U.S. President Abraham Lincoln as a Christmas present. Steam engine rides and social events are hosted on the railroad yard's premises, including the railroad roundhouse. If you would like to extend your visit to more historic sites, purchase the "See 3 Pass", which grants admission to 3 choices from this list: Georgia Railroad Museum, Pin Point Heritage Museum, Savannah History Museum, Old Fort Jackson, Savannah Children's Museum. To mount the fiery rail! November 26 - December 26, 2015 at the phenomenally popular Savannah Theatre. Located on Chippewa Square, the historic theatre opened originally December 4, 1818. It is the oldest theater in continual operation in America. National Museum of the Mighty Eighth Air Force. Did you know that CBS news anchor Walter Cronkite flew with the Mighty Eighth Air Force out of England into air raids over Europe? An HBO series is in development about the Mighty Eight Air Force, at its peak of activities during World War II. Steven Spielberg and Tom Hanks are behind the effort. "From Movie Induced Tourism, a study by Roger Riley, Dwayne Baker, and Carlton S. Van Doren, in the October 1998 issue of Annals of Tourism Research. The authors examined the reasons people visit film locations and determined that 'if part of a movie is extraordinary or captivating, it serves as an icon which viewers attach to a location shown in the movie ....Icons, abstract or tangible, become the focal point for visitation.' They found that, on average, visits to movie locations increased 40-50 percent after a film's release, and that movie-induced effects on tourism lasted for approximately four years." Source: Harper's Review, January 1999. Please visit the National Museum of the Mighty Eighth Air Force to honor those that Tom Brokaw call "The Greatest Generation", including the U.S. Eighth Air Force heroes who served America's military. Stop in for lunch in the World War II themed Betty Bombers All American Eatery, just off Forsyth Park in downtown Savannah in the building of the Mighty Eighth's founding headquarters. Perfect Timing. Make plans now to get away to Savannah GA in winter!